Parental controls are something that all game platforms must have in order to survive in a world where gamers range in age from 2-years old up to 102. Since OnLive launched their cloud gaming service, it has been one of the topics that has been discussed often among the community. OnLive couldn’t possibly make large strides in the gaming industry without some sort of parental control system. “Being a dad and a gamer on OnLive is a blast. Jumping into LEGO Pirates of the Caribbean in co-op mode with multiple controllers and taking Brag Clip videos of our best moves to share with Mom is great family fun. But if you’re like me, you know there are a bunch of games in the Arena that some kids may not be ready for,” explained Bentley. After over a year of waiting for Parental controls to be enabled for OnLive, they are finally here, and the system appears to take a lot into consideration. The parental control feature seems very comprehensive, as it doesn’t only include the ability to play certain games, but also the ability to block voice chat, brag clips, spectating, or even specific indie games that don’t have a rating. We talked to OnLive Founder and CEO Steve Perlman about why parental controls weren’t released sooner. Setting up parental controls in a system as sophisticated as OnLive couldn’t possibly be an easy thing to accomplish. There are many aspects of OnLive that make it different from the typical video game system. So what does the addition of parental controls mean for the future of OnLive? It will certainly bring in new publishers who were previously worried about kids gaining access to adult oriented games. More publishers of children’s titles will now see OnLive as a safe place to put their games, where children won’t be able to access inappropriate material. We asked Steve Perlman if this means we will see more children oriented games begin to come to the service. Perlman also noted that many OnLive users were a little confused to see games such as Let’s Ride come to the service. OnLive is an 18-year and up service, and the majority of adults aren’t interested in games such as this. However, with the introduction of parental controls, the service now becomes one appropriate for children. This is the reasoning behind adding children’s games to the service in the past. They were all part of getting prepared for the release of parental controls. While the parental controls are being released today, Perlman was quick to note that it is not yet a finished product. Perlman said, that they will certainly be listening to feedback on the new parental controls to see if there are some things that people may want. 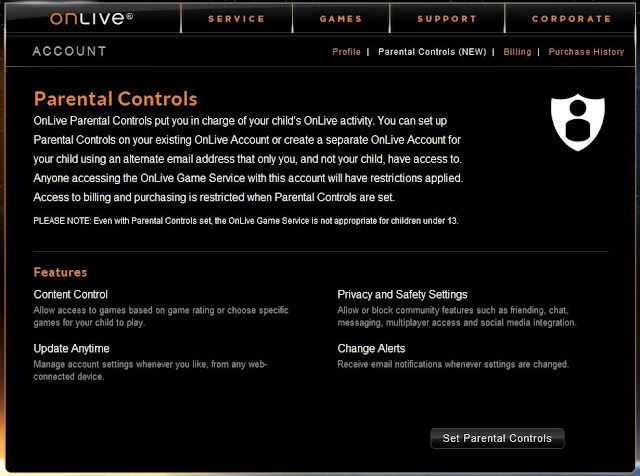 You can enable and set the parental controls when you login into your OnLive account on the OnLive web page.